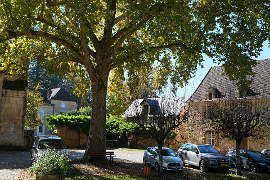 The Chateau de Losse is in the eastern side of the Dordogne department near to Montignac. 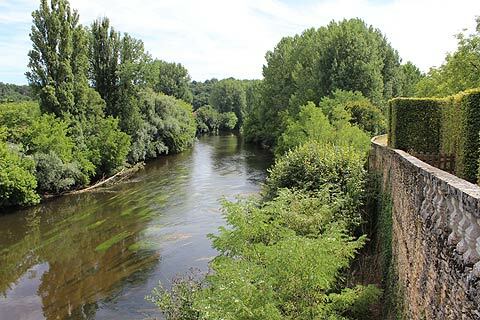 The Chateau de Losse is a very attractive castle which sits on the banks of the Vezere river. 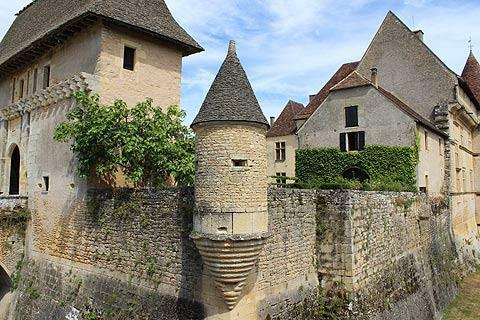 It is surrounded by remparts and a moat, though the moat no longer has water in it. 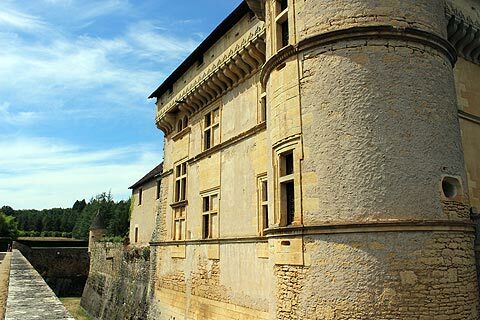 The Renaissance castle was built inside the walls of the medieval fortress in 1576 and has great views over the river. 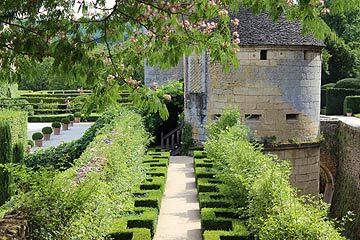 You enter the castle across a bridge over the moat and on to a fortified gatehouse which is the largest of its kind in Europe. This leads to the courtyard from where you get lovely views of the Renaissance castle. Inside the castle a wonderful stone staircase sweeps majestically to the upper floors. The dining room has a wonderful stone vaulted ceiling and the rooms are filled with 15th and 16th century furniture. A large terrace at the back of the castle offers views over the river. 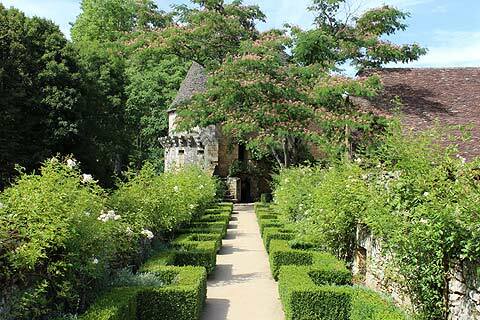 Surrounding the Chateau de Losse are its lovely gardens - awarded 'Jardin Remarquable' status in 2004. 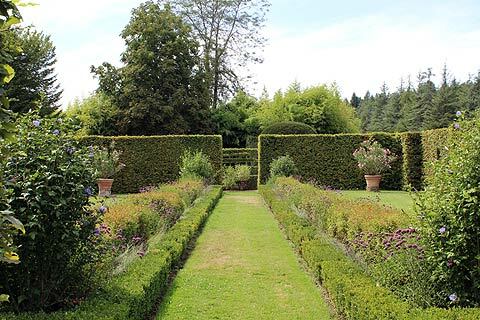 The gardens are laid out in a French formal stlye with walls of box hedging clipped into symetrical shapes. 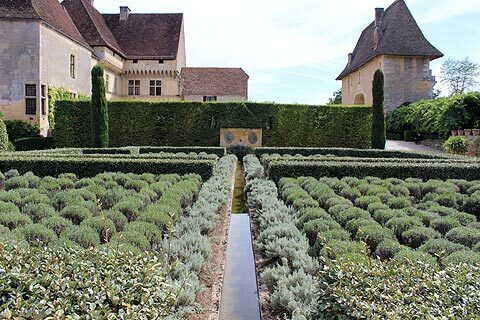 These are filled with catmints and lavenders and in my favourite part - the 'Chemin de Ronde' these are softened by the planting of white, scented roses. 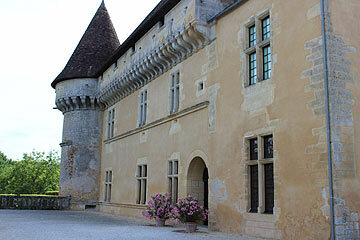 The Chateau de Losse is open every day except Saturday, 12pm to 6pm. You can take your own picnic or visit the tea rooms in the 'Princess garden' . The Chateau de Losse has 'starred' in various films including Ever After with Drew Barrymore. 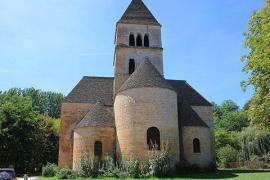 The origins of the castle date back to the 11th century when the Losse family arrived in the area from Flanders. 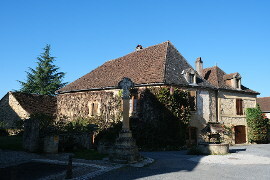 In the 16th century Jean II de Losse built the main residence with its Renaissance terrace. He also took the trouble to update the castle's defences in case of attack during this troubled time of history with the Wars of Religion. He added canons, introduced muskets and built an overhanging turret on the thick defensive walls to improve defenses. 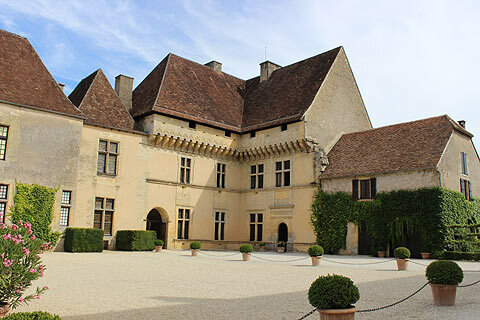 The furnishings inside the castle reflect the period that Jean II lived in the castle and give an insight into his lifestyle. The castle was listed as a 'historical monument' in 1928. 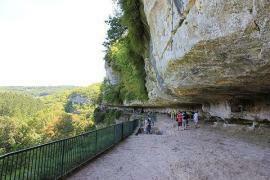 Le Thot to the north of Chateau de Loss is a museum and park dedicated to Cro-Magnon life. 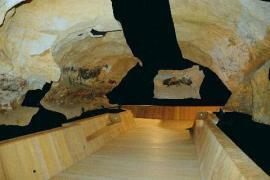 The museum has an interesting exhibition explaining the techniques used prehistoric cave paintings such as those at Lascaux and Font de Gaume. 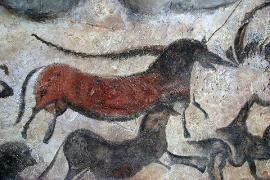 Its reconstituted paintings include some from Lascaux which cannot be seen on a visit to the caves. In the park at Le Thot there are animals whose ancestors are those which roamed the land in prehistoric times. These include reindeer and Przewalski horses. 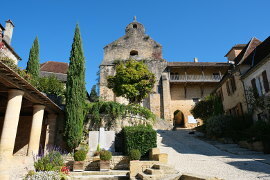 Montignac is a little to the north of the Losse castle. 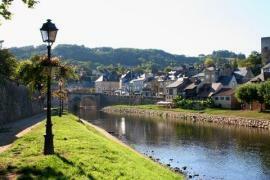 Montignac is a beautiful little town and of course home to the world famous Lascaux caves.